I came to a small but powerful realization today. 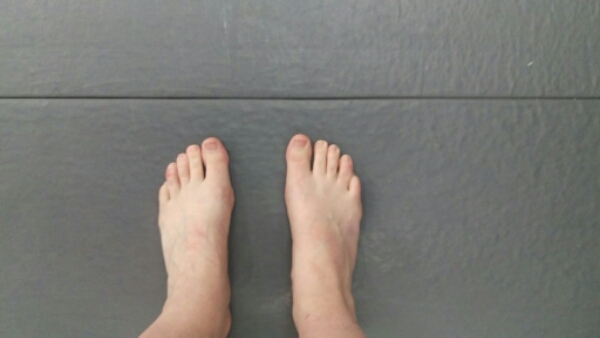 In my last post, I lamented the end of my “First Feet” photo album entries. I had privately wondered if I could make it a tradition with the next serious guy in my life (not that I’m going there anytime soon) or if that would be too weird. I was caught up in how I started it and wasn’t thinking about how it could evolve. Who said there had to be 4 feet to be First Feet? I’ve still got a lot of new experiences ahead of me. And I only need my feet to get me there. Maybe they’ll have company some of the time, but they look pretty good all on their own. Tonight I joined a Brazilian Jiu Jitsu class. The Academy is run by Jay Jack, who I’ve mentioned on my dog blog in relation to the behavior modification I’m doing with Dash. His wife, Mandy, happened to post information about an “on ramp” class starting tonight and running for 4 weeks. I’d been thinking about learning some skills that would serve me as a newly single woman. Learning to grapple and defend myself in awkward situations seemed like an excellent choice. As luck would have it, Delta’s Monday night Agility class is on hiatus and I’d been wondering what I’d do with myself. I can’t remember the last time I had a long stretch with no regularly scheduled activities during my evenings. The class meets twice a week so between that, training for my 5K on September 20th, and the daunting chore of packing for my upcoming move (exact location TBD), I should have a very busy, productive September.